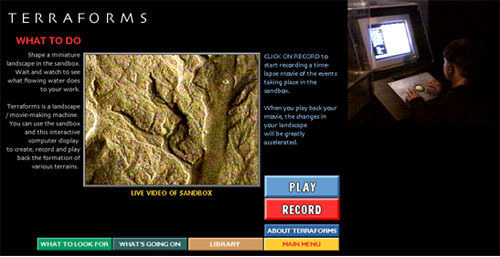 Terraforms was a duet for Sandbox and Computer built and installed at the San Francisco Exploratorium, 1989-1993 with a National Science Foundation fellowship. A video camera monitored, recorded and played back time-lapse movies of visiitor interaction with sand and flowing water. A digital library archives the geologic events in the sand.